It is the endoscopic removal of benign tumors (pedicle or sessile polyps), with the help of electric current and using a handle or hot clamp; other times, when they are small they can be removed without electric current. It is used for polyps larger than 0.5 cm. The procedure lasts for 5 to 15 minutes, however sometimes it may take a little longer depending on the size and location of the polyp. Why the polypectomy is performed? 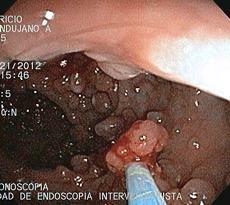 Endoscopic removal of polyps prevents their eventual uncontrolled growth, which in the case of so-called adenomas may be the origin of digestive (gastric or colonic) cancer. The detection and endoscopic removal of digestive polyps has modified the incidence of advanced cancer so that it may well be seen as a prophylactic measure against gastric or colonic cancer.